The dining room in your home is the space where your family gathers around for dinner in the evenings or where you share food with guests and friends. Cultivating a comfortable, functional, and beautiful dining space can help foster joy, laughter, and conversation over shared meals. At Furniture Connection in Clarksville, TN, we carry a wide selection of beautiful dining room furniture pieces, including kitchen tables, dining tables, dining chairs, and full dining sets. Our dining room furniture options are designed to suit a wide variety of spaces and styles, from small, modern breakfast nooks to elegant, expansive dining areas. Whether you want a grand setting to entertain coworkers and guests or a cozy, relaxed atmosphere for kids to do homework, we have dining room furniture options that will suit your needs. Our dining room furniture selection at Furniture Connection is designed for a wide range of aesthetics and functions, from contemporary to traditional and elegant to minimalist. Kitchen tables: Our kitchen table selection is perfect for adding additional space to your home for breakfasts, homework, family dinners, and more. Dining tables: Our dining table selection includes everything from modern, round tables with metal legs to elegant wood pieces with ornate carving. Dining room sets: Our dining room furniture collections are perfect for those who want to completely redo their dining room aesthetic or furnish a new space all at once. Choose from sleek, minimalist options or luxurious, traditional settings. 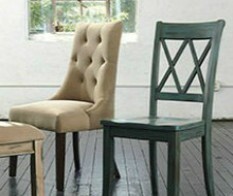 Dining room chairs: If you’ve already found a dining table you love but want to choose new or contrasting chairs, you’ve come to the right place. Our dining chair selection includes upholstered chairs, wooden chairs, and more, giving you plenty of options for comfortable, beautiful seating. Dining collections: We carry a wide variety of dining room collections to outfit your home in your preferred style, from classic elegance to a rustic farmhouse feel. 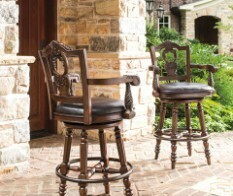 Bar stools: Our bar stool selection includes adjustable height bar stools and stools with and without backs, providing you a wide array of choices for alongside your built-in bar, kitchen island, or breakfast nook. 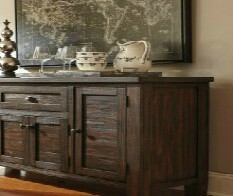 Buffets and servers: Our buffets and servers offer the perfect complement to any dining room table set, serving as storage and allowing you to set out additional dishes or buffet-style meals. 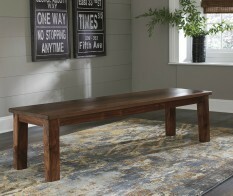 Benches: Benches offer unique, versatile seating options that can fit snugly along the side of a room or alongside a dining table. 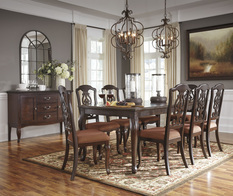 Our dining room furniture selection at Furniture Connection in Clarksville, TN, comes from the exceptional furniture designers at Ashley Furniture. With dining room furniture from Signature Design by Ashley and Ashley Express, we bring you the best the industry has to offer, with styles designed for a wide range of aesthetics and applications. Whether you’re interested in buying new dining room chairs that match your existing dining table or you want to complete remake your dining space with a new dining furniture collection, our team is here to help. 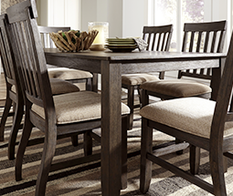 Explore our dining furniture collection online or come into our Clarksville, TN, store to see our beautiful dining furniture offerings for yourself. Call us today to get started!